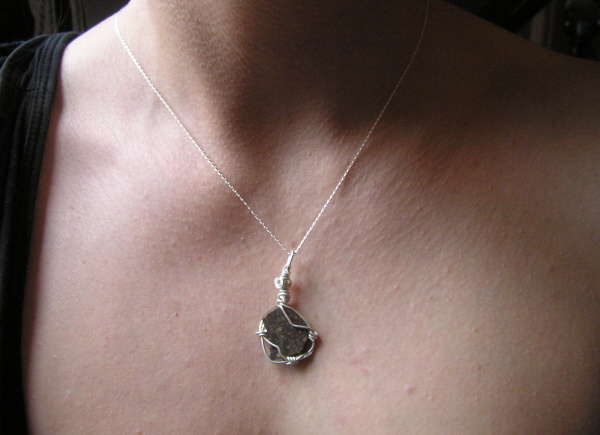 The Meteorite slice is a lovely dark brown/black colour with gorgeous little flecks of ferrous iron. The pendant is made with a polished slice,roughly 2cm across and it has been nicely wire wrapped with silver wire and then strung from an 18 inch sterling silver chain. The one you receive won't be exactly like this one, as I use a unique slice for each necklace, but will be very similar in size and style. The beads used may vary slightly too. Comes boxed in a stunning black velvet lined jewellery box - and complete with an A4 meteorite information sheet and signed certificate of authenticity.